MTUA: Doepack posted this Metra news about #425 back on December 15, 2017 on page 84. Thanks, I had looked back into summer 2018 but didn’t think #425 came out so long ago. At this rate we might have to wait for Christmas 2019 for another present - yellow and green? Maybe platinum mist (faux stainless) & Chinese red? Here's one with the Rock Logo on the nose. ChicagoRailfanner1989 wrote: I don't know if you've heard, but this past Thursday evening, 204 and 205 while on their way to Progress Rail for rehab by a CSX train derailed near Sherwood, Tennessee. The flat cars fell on 205 while 204 stayed on the rails. 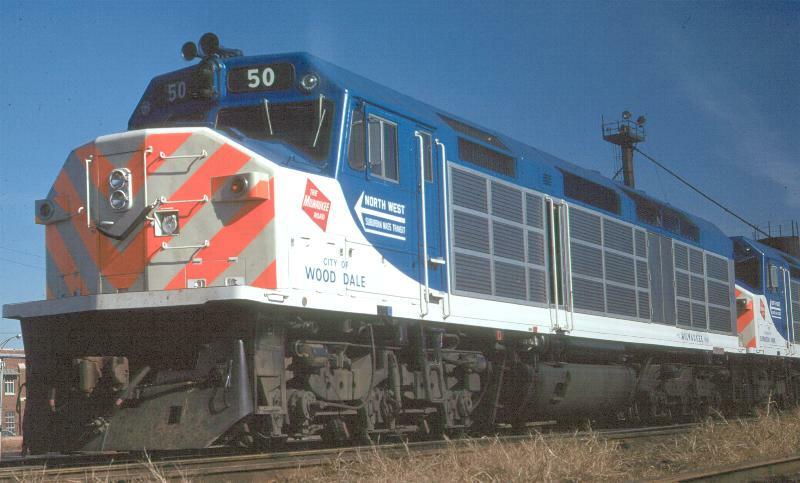 204 recently returned to Metra service on RI, rebuilt as an F40PHM-3. As a commuter from January 1998 through end of last year I kept a record of the locomotives which hauled my trains on UP-NW. 193 is in service on BNSF. Was in the lead on a double header with a F40PH-3. I think at least one person on the Metra board will push for as many commemorative paint jobs as they can get away with. Would have been nice if 100 had an actual RTA paint job and not just a wrap. I like that scheme. F40 and Everyone: I agree with your thoughts - restoring #100 to its original as-delivered RTA color scheme would have been a good move by Metra. The trouble with the wrap commemorative used is that it read Metra instead of RTA and the blue base color appeared faded. Last edited by MACTRAXX on Fri Apr 12, 2019 9:45 am, edited 1 time in total. I liked the NWSMTD livery. But I don't think it would look right on anything but an F40C due to the stainless side panels. F40CFan wrote: I liked the NWSMTD livery. But I don't think it would look right on anything but an F40C due to the stainless side panels. I saw an F40PH model painted that way once on the web mislabeled as an F40C. Wasn't workin', in my opinion. The F40PH model was factory painted that way by Life-Like, along with the BN E9 scheme. Looks like they were trying to cover all the Chicago commuter lines with the closest model they had. I imagine not many Nortran models were sold outside their territory. Also two semi-separate agencies split the F40C order. The North and Northwest Suburban Mass Transit Districts. Ah, there it is. Thank you. I find it extremely amusing that they were produced by "Life-Like".